Heat oven to 450°F. Spray 8-inch square pan with with cooking spray. In medium bowl, stir cornmeal, Bisquick mix, buttermilk, butter, chili powder and egg until mixed. Pour into pan. Bake uncovered 18 to 20 minutes or until toothpick inserted in center comes out clean. Meanwhile, in 2-quart saucepan, heat chili and tomatoes over medium heat, stirring occasionally, until bubbly. Cut corn bread into 4 squares; cut each square diagonally into 2 triangles. Split each corn bread triangle horizontally. Fill triangles with 1/4 cup chili mixture and cheese piece. Spoon about 1/4 cup chili mixture on top. 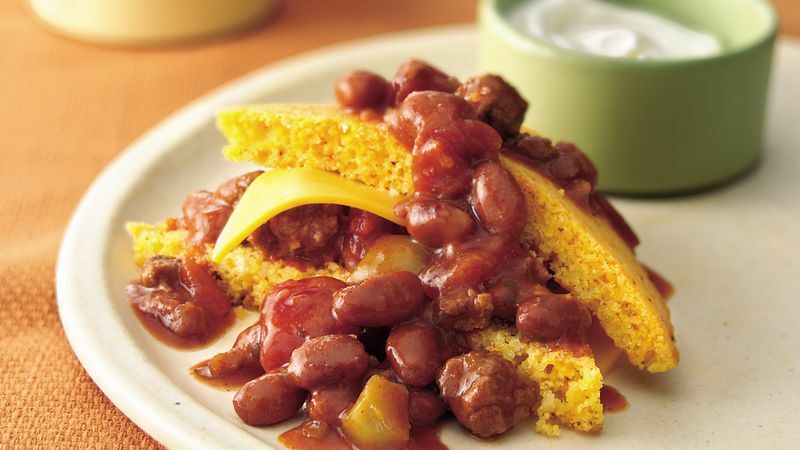 This is a quick meal, but when time is at a premium, just leave the corn bread triangles in one piece, top with cheese and spoon the chili on top. Jazz up these stacks with strips of red, yellow or green bell pepper placed on top. If you like, you can serve them with sour cream or guacamole, too.